Better Buy: Alnylam Pharmaceuticals, Inc. vs. Ionis Pharmaceuticals Inc.
A battle of the RNA-targeting drugmakers. This edition of our Better Buy series compares two biotechs -- Alnylam Pharmaceuticals (NASDAQ:ALNY) and Ionis Pharmaceuticals (NASDAQ:IONS) -- that are developing new drugs that act one step upstream of where drugs have traditionally worked. Most drugs target proteins (or are proteins themselves). Proteins carry out actions in the body through either signaling or by acting as enzymes that make molecules in the cell. Anti-inflammatory drugs that block TNF-alpha fall into the first category, blocking TNF-alpha from stimulating immune cells. Statins, which block the process of making cholesterol, fall into the latter category. Alnylam Pharmaceuticals and Ionis Pharmaceuticals are developing drugs that target RNA, one step upstream from the proteins. DNA is transcribed into RNA, which is then translated into proteins. By targeting the RNA, the drugs can lower the level of protein, having the same effect as inhibiting the protein. But since the structure of RNA molecules are consistent while proteins are three-dimensional and vary greatly, duplicating the process to make drugs to bind to different RNAs is a lot easier than making drugs to bind to different proteins. Ionis uses antisense to bind a single-stranded oligonucleotide to the RNA molecule, which is then degraded by a protein made by the cell. The company has been developing the platform for more than two decades, so it's had time to work out all of the kinks -- and there have been a lot of them. Alnylam's drugs are based on RNA interference (RNAi), where a double-stranded RNA is bound to a protein complex made by the cell that cleaves the RNA corresponding to one strand of the double-stranded RNA. Both platforms have had stability and targeting issues that have hampered their development, but Alnylam and Ionis have improved on their first-generation molecules to work out the kinks. Ionis, which was founded in 1989, has had a longer time to work out the details and therefore has substantially more drugs in its pipeline. The biotech has almost 40 drugs in its pipeline versus Alnylam's 18 or so programs, although only seven of those are in the clinic. Ionis has developed many of its drugs with a multitude of partners, including some big names in drug development, such as Biogen (NASDAQ:BIIB), Roche, GlaxoSmithKline, and Bayer, as well as some smaller biotechs. Biogen has actually licensed multiple drugs from Ionis Pharmaceuticals at different stages, with the most recent being a large-scale discovery deal between Ionis (then called Isis) and Biogen. Alnylam, on the other hand, has multi-drug deals with Sanofi (NASDAQ:SNY) that date back to 2012, when it licensed Alnylam's transthyretin-mediated amyloidosis program. In 2014, Sanofi took a 12% stake in Alnylam at a substantial premium to the share price at the time for licenses to three more drugs and options on all rare genetic diseases from Alnylam's pipeline through roughly 2020. Last October, Sanofi took one of those licenses on ALN-AT3 for hemophilia. Alnylam also has a one-drug deal with The Medicines Company on ALN-PCSsc, a phase 1 drug for patients with high cholesterol levels. While having partners reduces profits once the drug is on the market, help from a larger company reduces the cost and provides capital to develop more drugs without raising funds by diluting shareholders. The partners also serve as an endorsement of their technology. I'd give a slight edge here to Ionis, simply for having more partnerships with major drugmakers. Based on their market caps, investors are valuing Alnylam at about a 20% premium to Ionis after both were beaten down from their all-time highs last year. However, if you back out their cash, the companies' valuations are nearly identical. 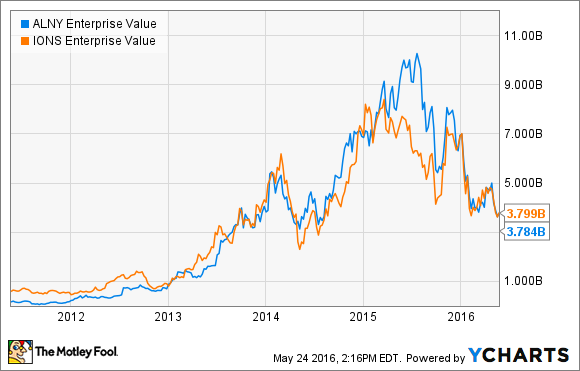 ALNY Enterprise Value data by YCharts. With a stronger pipeline that you're not paying extra for, Ionis is the clear winner, here. Admittedly, there's some evidence that RNAi may be more potent than the technology Ionis has used for with its phase 3 drugs, and that's probably why their pipelines are valued the same despite the size differential. But, it isn't clear that the extra boost will produce a clinical benefit, and Ionis has a next-generation technology that's substantially more potent than what's in its phase 3 drugs. While Ionis looks like a better investment to me, that's not to say Alnylam won't do well from here. With about $1 billion in the bank, the biotech has a nice runway to develop its drugs. There's certainly no reason an investor can't have a stake in both -- The Motley Fool does.